Jared Dudley's 25-footer with 38.6 seconds in the extra period gave the Clippers the lead, and Chris Paul sank five free throws to close out a 120-116 win over Minnesota on Sunday. Forward Jared Dudley was well aware of his offensive struggles on the Clippers’ road swing through the east earlier this month. But in case he wasn’t, a text from someone near and dear provided a reminder. "I think my mom texted me, ‘I know you can play better than this,’" Dudley said Sunday night. "If your mom texts you, you know you’re not playing well." Dudley wasn’t. His shots weren’t dropping, and his confidence was waning. The more he shot, the more he missed. Things are better now, although not completely. Dudley missed his first six three-point attempts Sunday against the Minnesota Timberwolves at Staples Center, but when he finally came through in overtime, it made a difference. His 25-footer with 38.6 seconds in the extra period put the Clippers in front, and Chris Paul sank five free throws to close out a 120-116 win over Minnesota. The win was the Clippers’ fifth in a row and seventh in eight games, but unlike their previous wins in their streak, this one was neither routine nor easy. The blew a lead, lost their composure and fell out of rhythm, but they still found a way to gather themselves and beat a Timberwolves team that got a combined 79 points and 33 rebounds from Kevin Love and Nikola Pekovic. "It was a great lesson for us," coach Doc Rivers said. "I kept saying it down the stretch, ‘It’s not over, there’s plenty of time.’ I give them credit. They kind of hung in there." 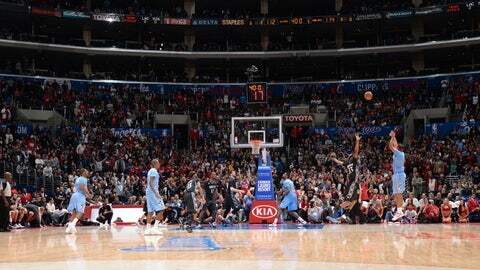 The Clippers discovered their resilience in the final seconds of the fourth quarter when the game appeared lost. Down 106-104, Paul poked the ball away from Kevin Martin at the Clippers’ end with 8.1 seconds left. Jamal Crawford grabbed the loose ball and dunked it, sending Staples Center into a frenzy and the game into overtime. Then, after a Pekovic baby hook gave Minnesota a 114-112 lead, Dudley took a feed from Paul and got a wide open look at the basket to put the Clippers in front. It was the only three-pointer the Clippers made in the extra period, going 1 for 6. "The biggest thing we learned as a team from Doc is, even in practice, he talks about the game is not over," Paul said. "When we got down three or four there with seconds left, we could’ve said, ‘We lost this one. We fought hard.’ But it’s crazy because he says that all the time. The game is not over. Extend the game." Dudley was not aware he was 0 for 6 from long distance until his go-ahead basket, but it didn’t matter. "You’ve got to make those ones," he said, "especially when you get wide open in a clutch situation. I’m glad I did." I'm still on that adrenaline rush!!!!! What a game!!!!! On the road, he couldn’t make anything. Against the Philadelphia 76ers on Dec. 9, he was 4 for 15. Two nights later at Boston, he was 3 for 9. And the next night at Brooklyn, he was 1 for 7. That’s when his mom let him know. "I was just missing open shots," he said. "It was an adjustment. For me, it was just, enough’s enough, and since the Washington game, I got more confident. Once (teammates) see the ball go in, they tend to pass the ball a little bit more and set harder screens." Clippers forward Matt Barnes, in only his second game back after eye surgery, was ejected in the third quarter after a hard foul on Love following a rebound. The call was questionable; Barnes was clearly going for the ball, but he caught enough of Love that the game officials took a closer look and gave him a flagrant 2 foul, meaning he was tossed. Later, Love took down a rebound and elbowed Blake Griffin, who was cut on the forehead on the play. Rivers questioned why the officials didn’t look at a replay to see if Love deserved a flagrant foul. "First of all, it wasn’t a flagrant 2 (on Barnes)," Rivers said. "I didn’t think it was a flagrant 1. He got mostly ball and he swung at it. The only problem in the way that was done, Blake’s should’ve been looked at. I don’t know if it was flagrant or not with Kevin Love, but if you’re going to look at Matt’s, you have to look at Blake’s. It was an elbow to the head where a guy was bleeding." The Clippers lost that argument. They didn’t lose the game.